Today the church celebrates the feast of a saint who was the Bishop of Geneva and also a very popular spiritual writer even today. The following are some of his quotes. "How displeasing to God are rash judgments!" "Self-love ordinarily leads us astray from reason, directing us insensibly to a thousand small, yet dangerous, injustices and iniquities..."
"Do not be ashamed to practice those common and necessary actions that bring us to the love of God." "It is an error, or rather a heresy, to try to banish the devout life from the regiment of soldiers, the shop of the mechanic, the court of princes, or the home of married folk." "Have in mind these four things: that by sin you have lost the grace of God; that you have given up your place in paradise; that you have chosen the eternal pains of hell; and that you have renounced the eternal love of God. If you desire,...to undertake a devout life, you must not only cease to sin, but you must also cleanse your heart from all affection for sin." "...we must purge the soul from every affection to venial sins." "A venial sin, no matter how small, displeases God, though not to such a degree as to cause him to cast off or damn us for it." 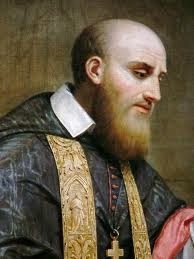 "Above all, I recommend to you mental prayer, the prayer of the heart, and particularly that which concerns the life and Passion of our Lord." "Begin all your prayers, whether mental or vocal, in the presence of God." "The rosary is a very useful form of prayer, provided you know how to say it properly." 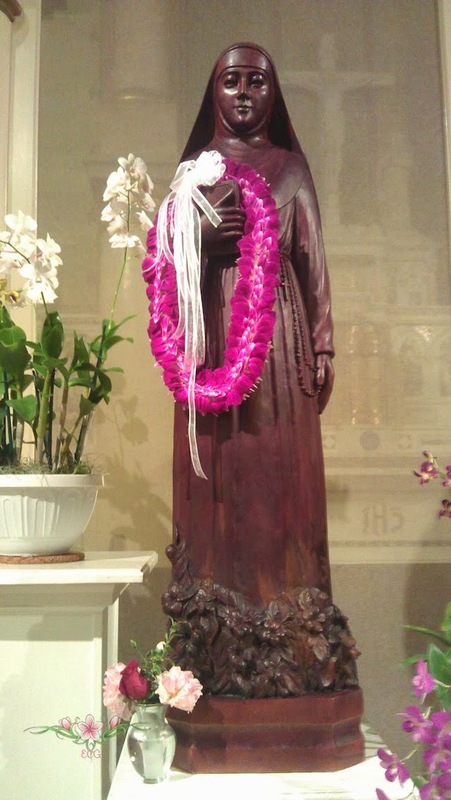 Wooden statue of Saint Mother Marianne Cope that was temporarily housed at the Cathedral of Our Lady of Peace. Same Cathedral where Father Damien was ordained. 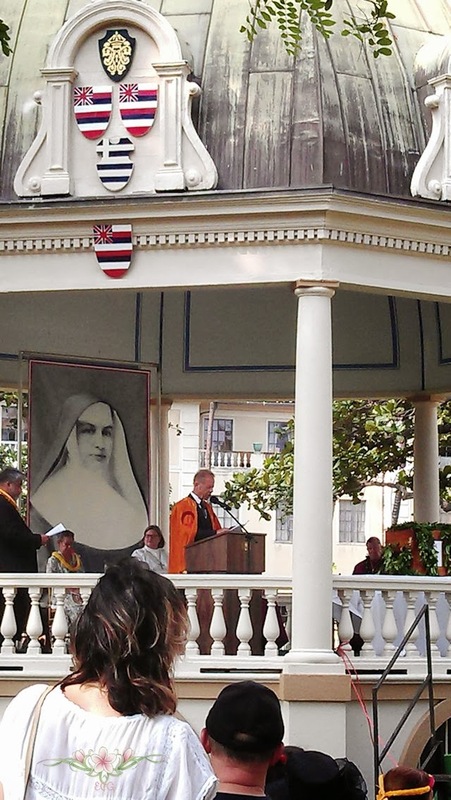 Following the canonization, Honolulu celebrated its newest saint with a special mass at the Cathedral, procession of the relic to the only royal palace in the United States, Iolani Palace. The reliquary of Saint Mother Marianne Cope is on the opposite side of the Saint Damien reliquary in front of the adoration chapel in the Cathedral. 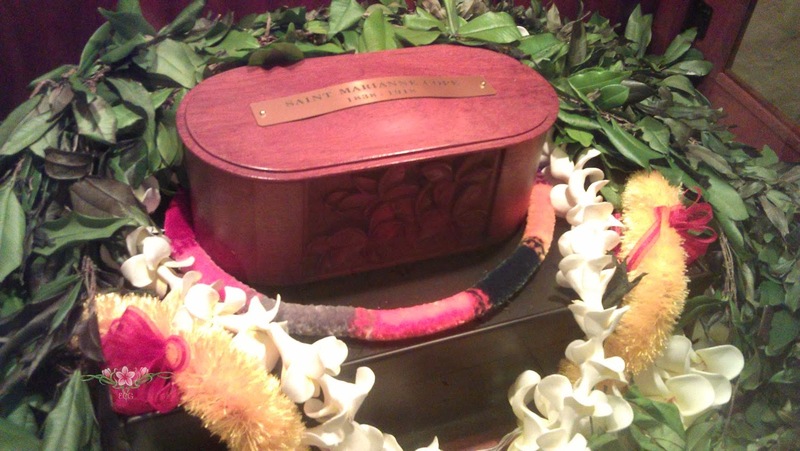 It is taken out for special occasions for veneration. you left your homeland, and you left your adopted home to care for those unloved, sick and forgotten in the Hawaiian islands.